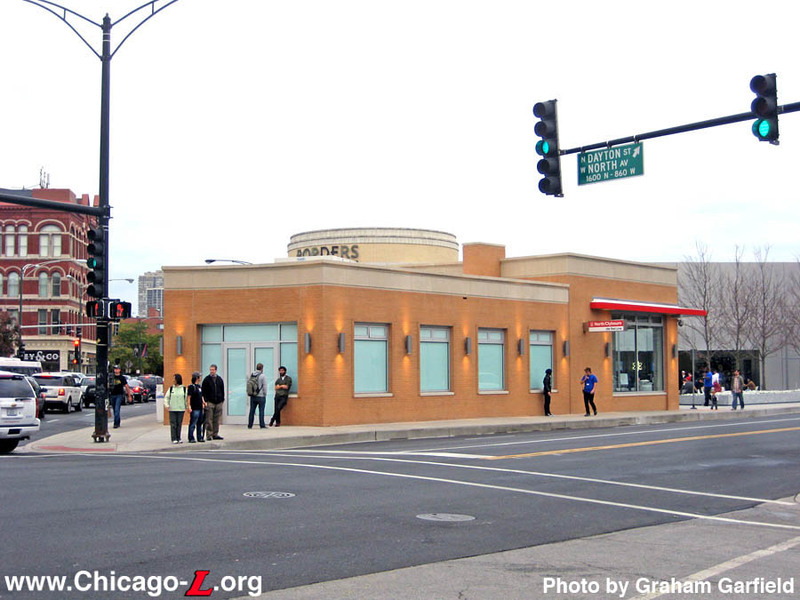 Designed by the firm of Shaw, Naess and Murphy in 1939, North/Clybourn is the only station in Chicago's Initial System of Subways to have an above-ground headhouse. 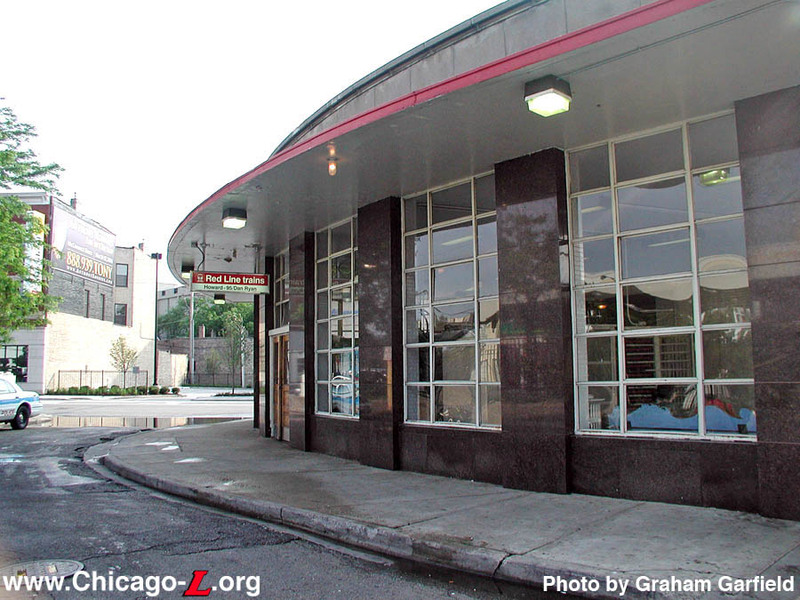 Built as part of the State Street Subway in the early 1940s, the station house is an example of "Depression Modern" architecture, perhaps more commonly characterized as Art Moderne. The only station on the entire "L" system to use Art Moderne in such a high-style fashion, the design featured many of the elements common to the Bauhaus-derived style. 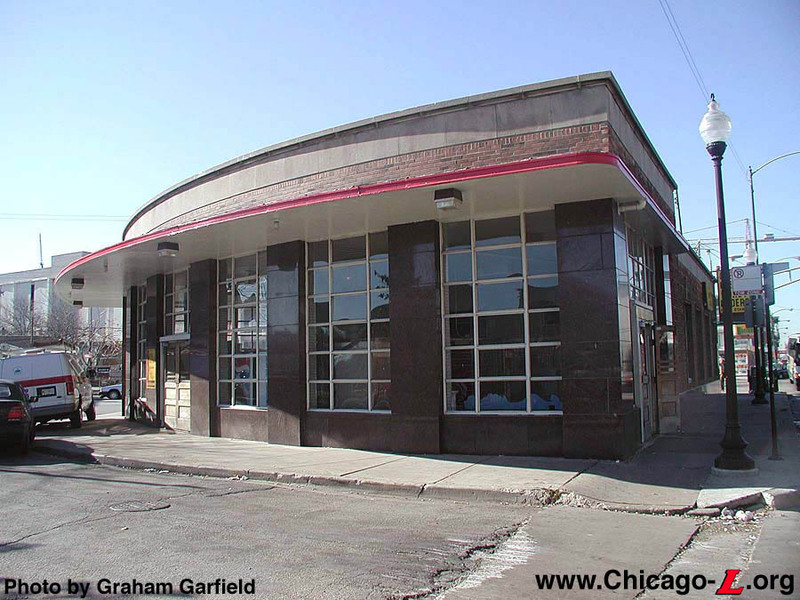 The building had a sleek, streamlined appearance, shaped like a quarter circle (or a wedge), with the two flat elevations along North and Clybourn avenues and a third elevation curved to connect the two. Interestingly, the curved side was designed as the principle elevation but faces neither of the streets that the station serves. 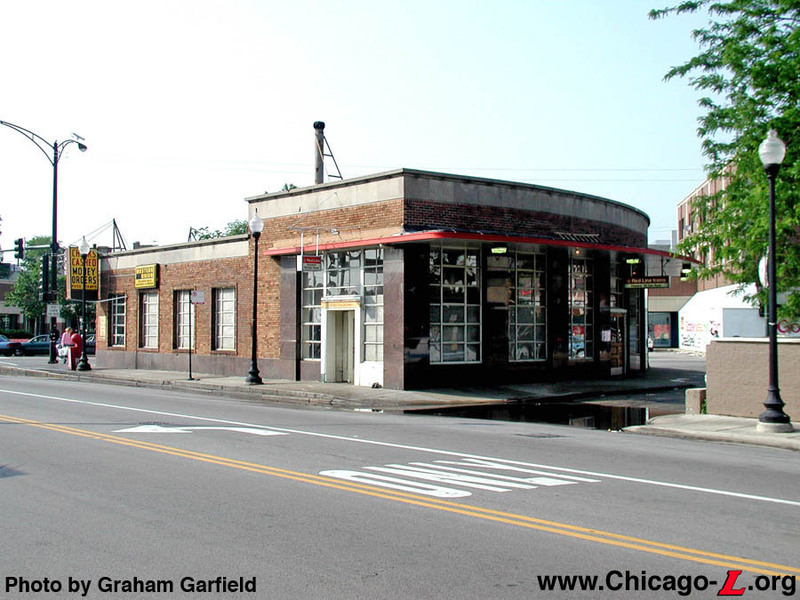 Rather, it fronted onto a driveway that originally wrapped around the east side of the station that served as an off-street bus transfer location -- first for trolley buses and later for motor buses -- which was a very early example (perhaps the first example) of a Chicago transit station designed for intermodal connectivity. 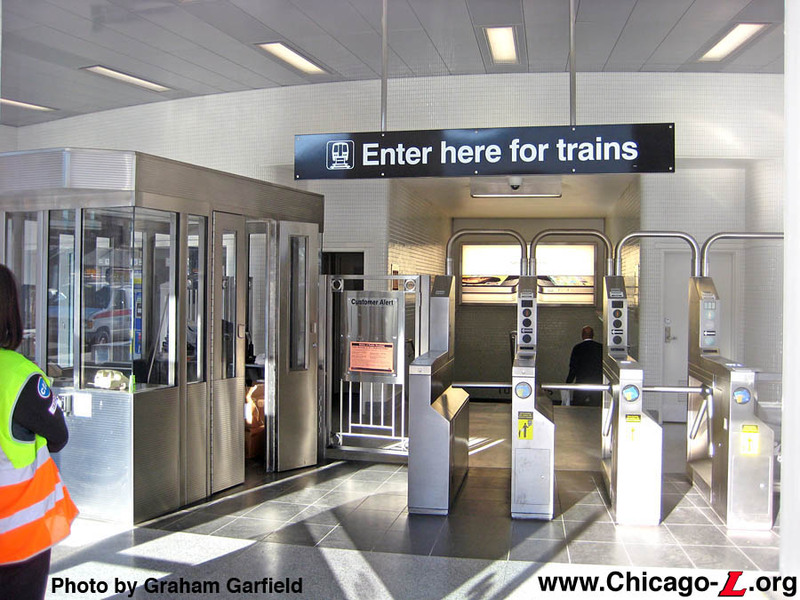 This is all the more interesting considering that the surface and rapid transit systems were still independently-owned companies at the time; their unification under the Chicago Transit Authority was still four years off from the station's opening day. 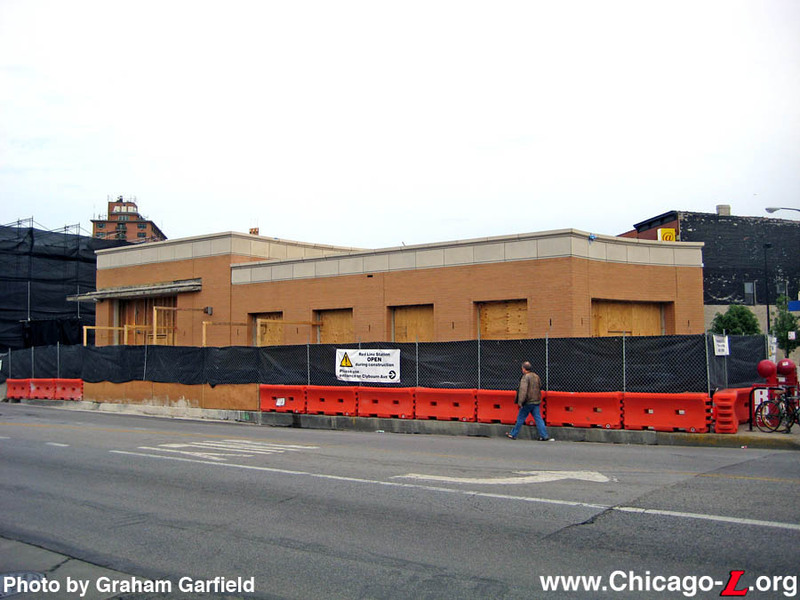 The North and Clybourn avenue exterior elevations, as well as a short elevation facing the corner of North and Clybourn, had brick facades with a granite watertable and a cut stone cornice. The curved elevation, whose form emphasizes the streamlined effect, was treated as a glass wall divided into panels by granite piers that supported a canopy around the bus loading area. Above the canopy, the rest of the exterior was brick topped with a cut stone cornice. Typical of the Art Moderne style, the station has a flat roof. The large windows were divided into square and rectangular panes with aluminum or stainless steel mullions and trim. 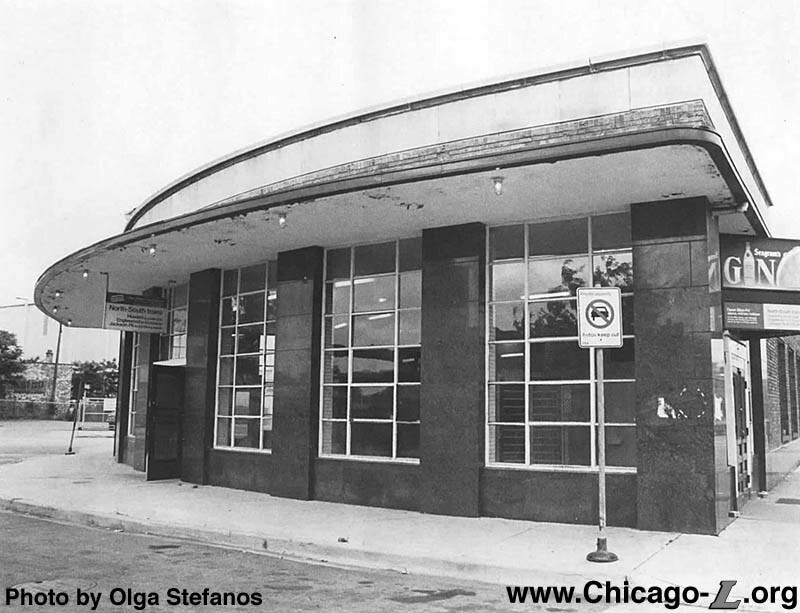 Originally, the cut stone cornice was decorated with large stainless steel letters that said "SUBWAY" -- once above the doorway on the corner narrow elevation and once each over the doors to the main waiting room at the east ends of the North and Clybourn facades -- long since removed from the exterior. The primary area of the interior is a large, open, airy space at the east end of the building. The east wall is the curved elevation that led to the bus turnaround (and now to a plaza), whose tall windows allow large amounts of natural light into the fare control area. There are also doorways onto the streets on the north and south walls which originally had rotating doors. 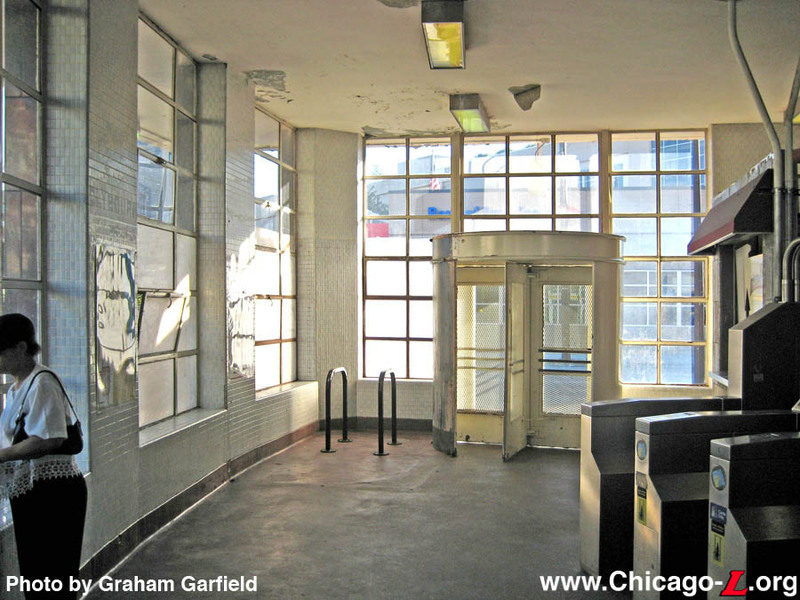 The south rotating door onto Clybourn remained until the station's 2010 renovation. In the center of the building is a stairway down to mezzanine-level passageways, which is surrounded by auxiliary and support rooms. 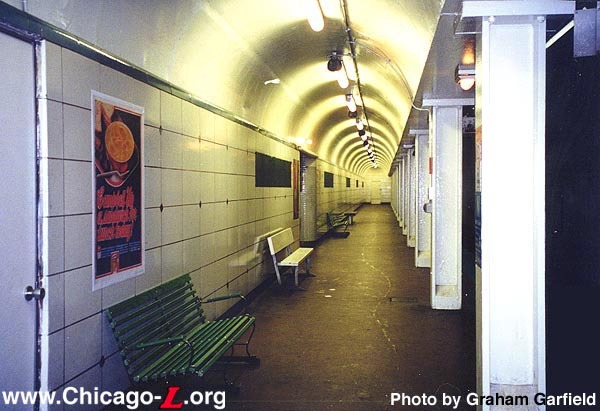 Hallways originally ran at street-level on both sides between the exterior elevations and the center support rooms, connecting the fare control area on the east side of the building to the entrance on the corner of the North and Clybourn at the west end of the building. 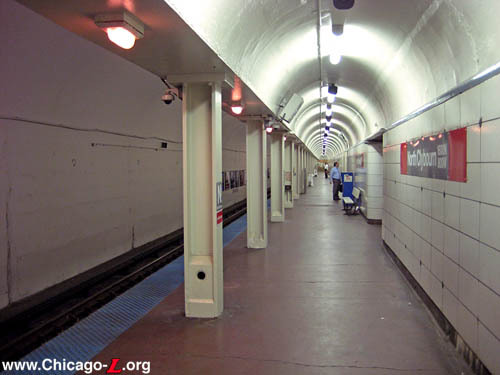 Subsequently, the west entrance was turned into a rental concession (inhabited by a Currency Exchange for much of its life, and later by various pizza restaurants in the 2000s), with the south hallway blocked off for use by the concessionaire and the north accessible only by CTA personnel. After passing through the turnstiles, passengers go down a doublewide staircase to a mezzanine level. 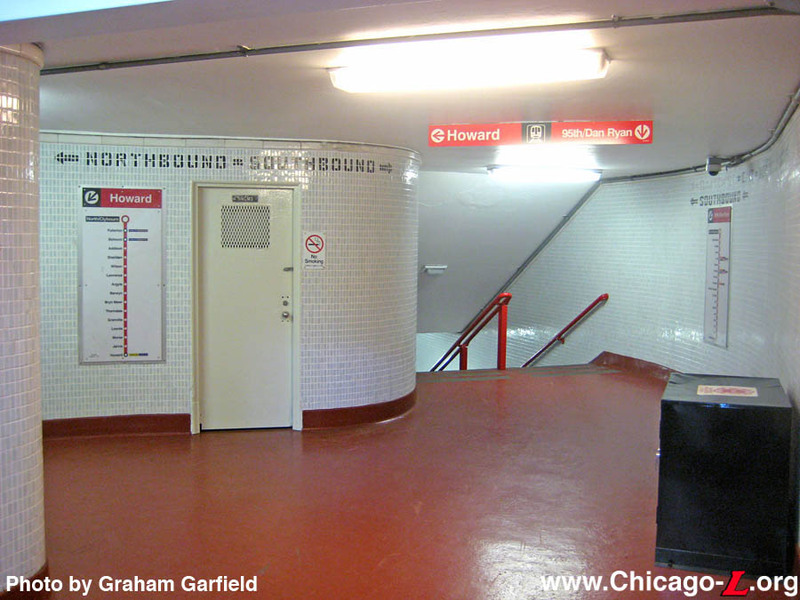 Here, it splits into two paths: one goes directly down to the northbound platform, while the other leads to a hallway underneath Clybourn then down to the southbound platform. 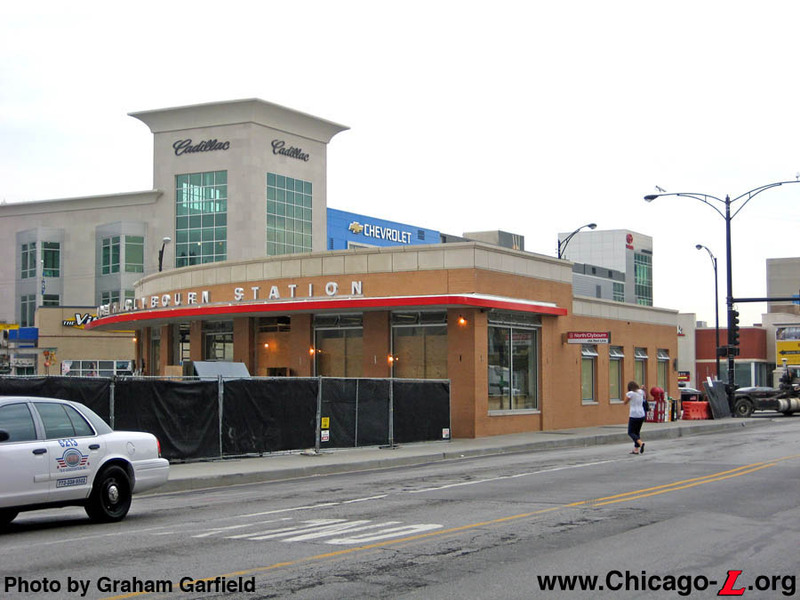 The interior build-out and finishes of the North/Clybourn station differed in many ways from the other State Street Subway stations, which otherwise all more or less follow the same pattern. 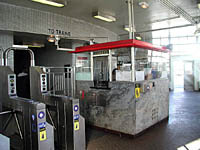 Besides forsaking the more typical mezzanine fare control area for an above-ground station house, there is no use of the gray structural glass panels that adorn the walls of the other State Street Subway stations. 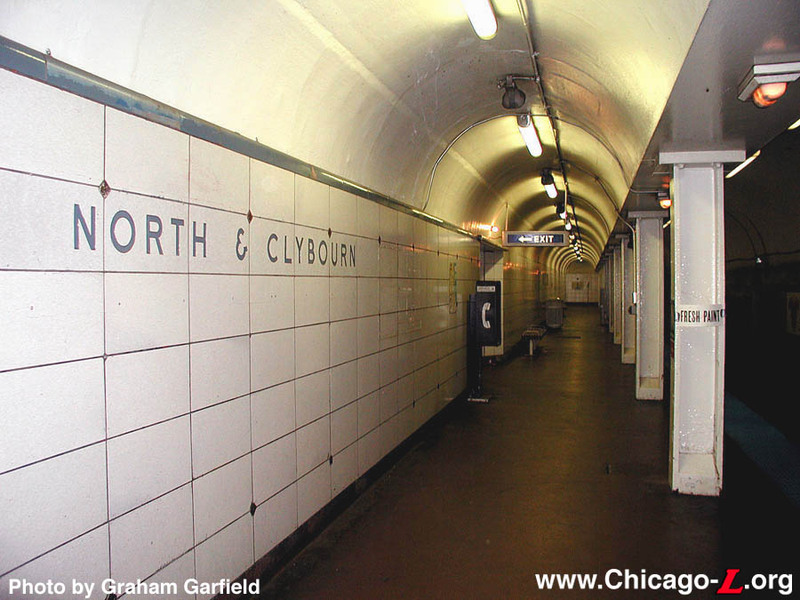 The interior of North/Clybourn used 1" x 2" gray glazed tiles on all interior walls, from the station house to the mezzanine and in all of the stairwells, which are otherwise only used in the street-to-mezzanine stairways and high-level transfer tunnels in the other 1943 subway stations. All of the inlaid signage and wording on these walls thus did not use the trademark Futura-derivative subway typeface but rather formed words by coloring certain tiles black rather than gray. These original tiles can still be seen in the mezzanine-level corridors and the stairways down to the platforms. Otherwise, the station had the passenger conveniences typical of the other subway stations, including men's and women's public restrooms, lockers, drinking fountains, and pay phones inside "soundproof" booths (which actually did insulate the user from most outside noise, in spite of its seemingly open design). The ticket agent's booth consisted of stone walls with a small ventilation grate near the bottom and glass windows on all four sides. Turnstiles were steel and the station house and mezzanine hallway had smooth red concrete floors. The dual side platforms -- only one of three subway stations not to have an island platform -- were more typical of the other subway stations. The platforms had red no-slip concrete floors, curved concrete ceilings and I-beam steel columns running down the trackside edge of the platform. 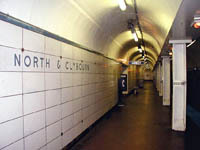 The platform walls opposite the tracks were clad in white ceramic tile from the floor to about 7 feet up, with a blue tile border along the top. (Blue was North/Clybourn's "accent" color, one of four rotated between the subway stations.) Fluorescent lights illuminated the platform, running along the center of the arched ceiling over the platform and under the soffit between the columns. 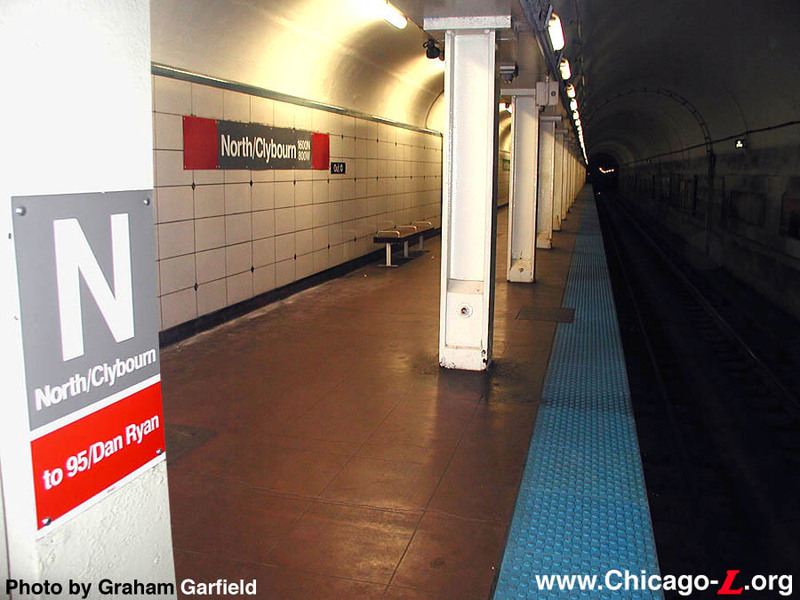 Illuminated signs hung over the exits from the platforms and the station's name -- "NORTH & CLYBOURN" -- was inlaid in the platform tile wall using the subway's signature typeface. Originally leading off from the mezzanine passage to the southbound platform was an auxiliary exit to Dayton Street. Splitting off from the hallway where it curves to the vertical access to the platform, a short series of stairs led to an intermediate level with two rotogates. Beyond these rotogates was a flight of stairs that led to the southeast corner of Clybourn and Dayton, across the street from the station house. At some point, this auxiliary exit was closed, with the street level entrance removed and sealed with concrete and a metal grate and a curtain wall built over the passage from the mezzanine hallway. It is not clear when the auxiliary exit was closed, though it may have coincided with the closure of two other auxiliary exit from State Street Subway stations -- the Polk exit to Harrison and the Ohio exit from Grand/State -- in the summer of 1968. All three were arranged so they could be converted to auxiliary entrances if desired, but none ever were. 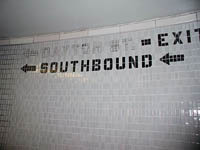 Tiled signs directing passengers to the Dayton exit were removed by having the tile pigment bleached or otherwise lightened, but the wording is still evident in the hallway walls. 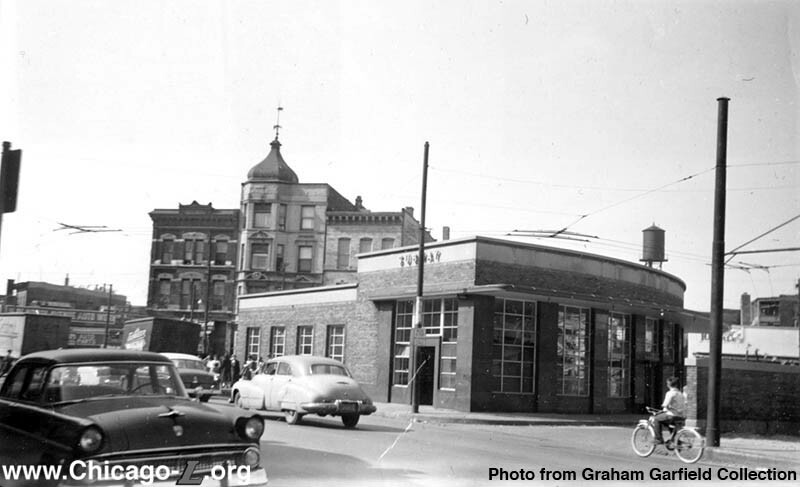 In later years, the area around the station declined and patronage dropped. Warehouses and industrial uses were situated to the northwest and the Cabrini-Green public housing complex was to the southeast. As deterioration and disinvestment set into the surrounding community, the station was used less and some maintenance was deferred. 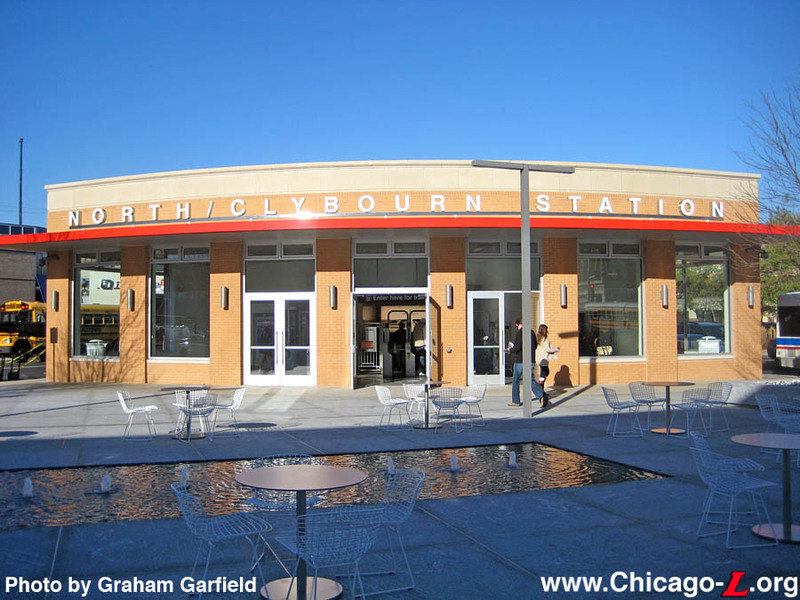 In January 1982, North/Clybourn became a "part-time" station, with no service on night, weekends, and holidays to save the cost of the station agent. The hours of the station were expanded just under a decade later when some weekend and holiday service was restored during daytime hours in Fall 1991, but the station remained closed nights. The station's part-time status was repealed on June 24, 1995, after which the station would remained open 24 hours a day, seven days a week. Other changes in North/Clybourn's service pattern occurred in the CTA's A/B skip-stop system, resulting in some of the most inconsistent platform signage on the "L" system. The KDR-era name signs are green, harking back to its days as a B station (1949-1979). 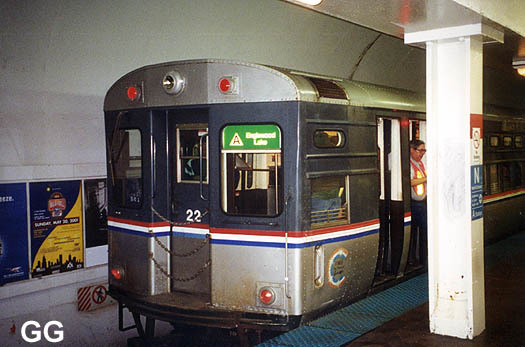 Later, it became an A station (1979-1995) and the green symbol signs were replaced with red ones. The green name signs remained, but later, the red symbol signs were replaced with blue symbol signs, instead of the A station-standard red. (In later years, the color-coding of signage to adhere to the A/B system was dropped and all station signs were blue.) Of course, after the A/B skip-stop system was abandoned in 1995 it all moot anyway, but it made for a rainbow assortment of signage on the platforms. This signage has since been replaced with Green Line-standard signage, which is gray and red to denote the station's line affiliation. The station house retained most of its design integrity until a renovation in 2010, when most of the exterior and interior materials were changed. The mezzanine corridors and platforms are still largely in original condition, however. The interior tile walls in the mezzanine were cleaned and re-grouted in 2002. The red concrete floors in the mezzanine and platforms are worn from years of foot traffic, but are not cracked or otherwise deteriorated. 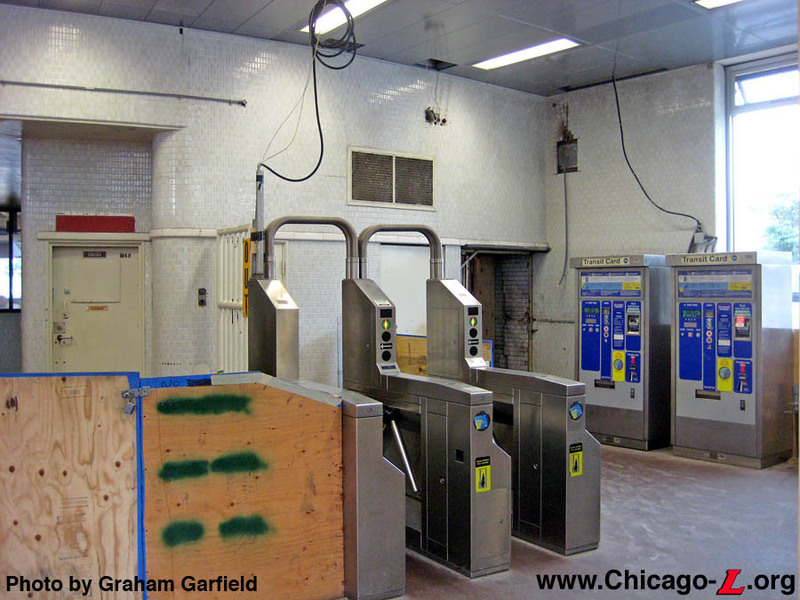 On the platforms, much of the original tile remains, but some is being held to the wall with bolts and square washers, while some large sections have been replaced with white tile of a clearly different type and size. 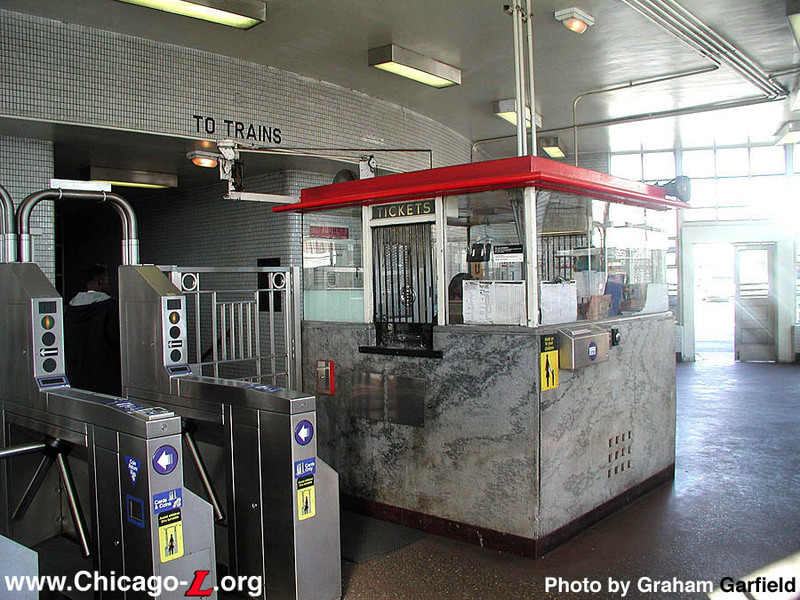 In March 2003, CTA began an escalator modernization at North/Clybourn with pre-construction work for the rehabilitation of the two mezzanine-to-platform escalators. Construction to these escalators started later that month. Rehabilitation involved completely stripping an escalator of all parts and replacing it with new or reconditioned parts, keeping only the original outer shell. The work continued through Summer 2003. On the northbound platform, the Moderne illuminated sign box over the exit remains and in Spring 2003, new sign faces were made for it with replications of the original graphics, including the correct colors and the specially-designed Futura-variant typeface used in Chicago's Initial System of Subways stations. 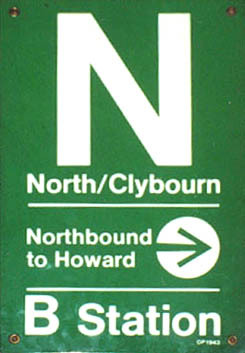 North/Clybourn received new platform signage in late April 2004. The dual subway platforms received new station name signs and new column symbol signs. The old KDR name signs were unusually large -- they were, in fact, fabricated as two halves installed next to each other, as the sign was too large to produce as one piece by the manufacturer in the 1980s -- and also had an unusual criteria for placement: they covered the original station name signs that are inlaid in the glazed tilework of the platform wall. The current Green Line Standard signs, with the combined station name sign and colored tabs on each end, also fit over the tile signs (albeit barely). But one original tile sign has been left exposed. On the northbound platform, the tile sign immediately to the north of the stairs/escalator to the street is exposed to public view for the first time since the 1980s. 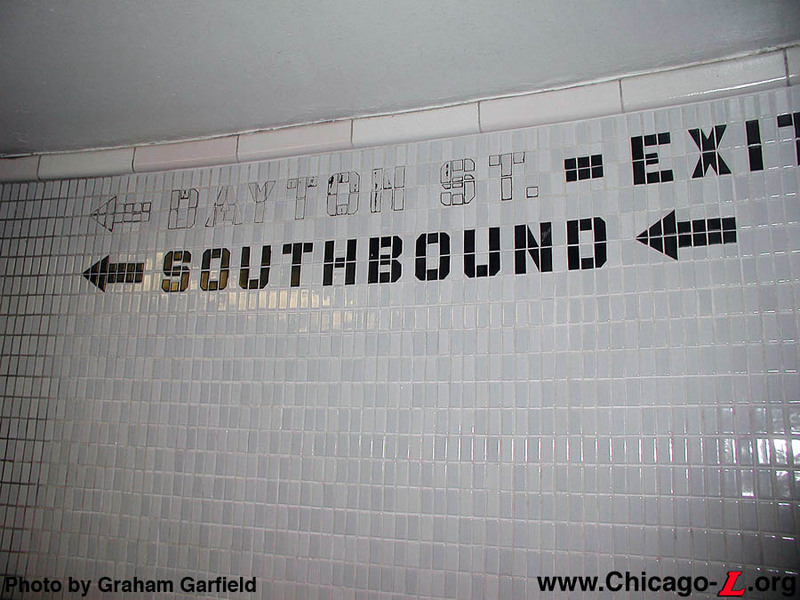 The lettering, reading "NORTH & CLYBOURN", is molded into the glazed block of the platform's back wall and is executed in the subway's signature Futura-variant typeface. The lettering is blue, reflecting North/Clybourn's "accent" color. Together with the illuminated exit sign over the doorway to the stairs/escalator just a few feet away (which also uses the station's historic color and typeface; the box is original, though the faces are actually reproductions), this makes this little corner of North/Clybourn a pleasurable throwback to the World War II-era opening days of Chicago's first subway! At street-level, three backlit boxes were also installed under the shallow canopy that extends over the curved side of the exterior along the bus turnaround, each with a modified station entrance sign. These were installed in March 2004, but removed in the station's 2010 renovation. Owing to the building's age, the redevelopment of the surrounding community with trendy shops and upscale housing, and the increase in ridership that has followed, North/Clybourn was included in the CTA's "Front Door Program", an initiative to add amenities and make aesthetic improvements to station entrances throughout the rail system. 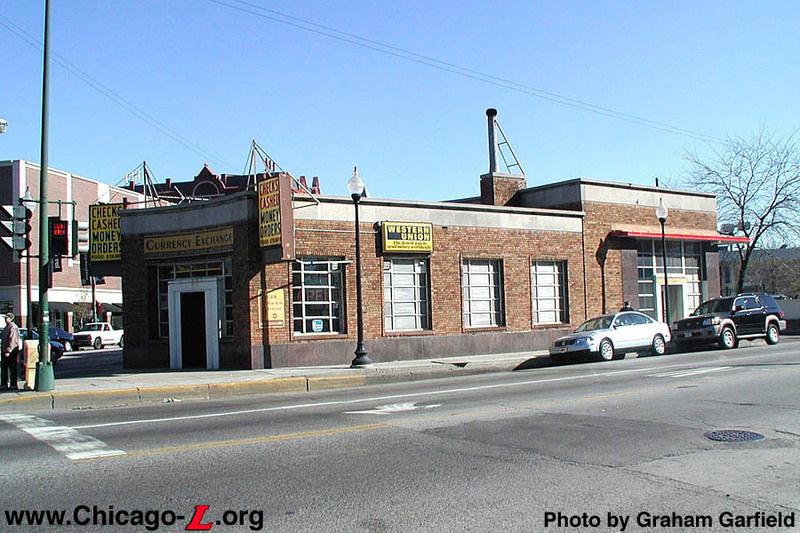 At its June 4 , 2003 monthly meeting, the Chicago Transit Board approved a $569,973 contract for Chicago-based Camp Dresser & McKee, Inc. (CDM) to design and prepare construction bid documents for the Front Door Program, which includes seven stations (North/Clybourn included). Upgrades at the seven stations were to include station identification signage, new fencing, reconfigured turnstiles, improved lighting and heating systems, benches/street furniture, improved bus waiting areas and bus information panels, landscaping and windbreaks, though not all seven locations will receive all of these improvements. Funding for this contract was provided by the FTA and the Regional Transportation Authority (RTA). The improvements were designed but never performed, with the project funds diverted to other needs. 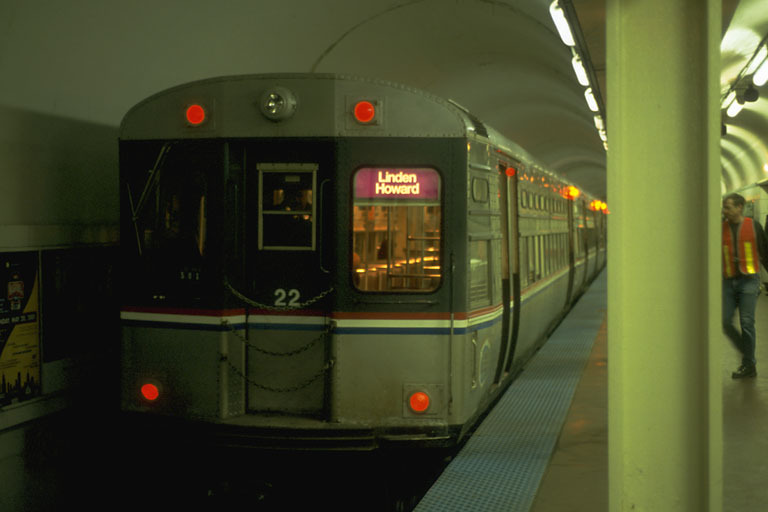 The building-mounted identifier design, with a backlit CTA logo, was later used at the Roosevelt Red Line station, however. 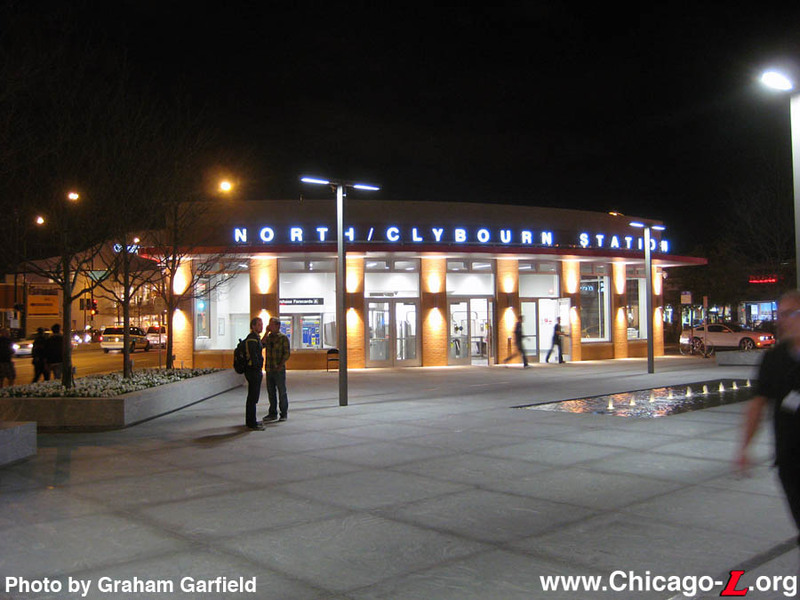 Through a partnership between the CTA and Apple, Inc., North/Clybourn station was renovated in 2010. 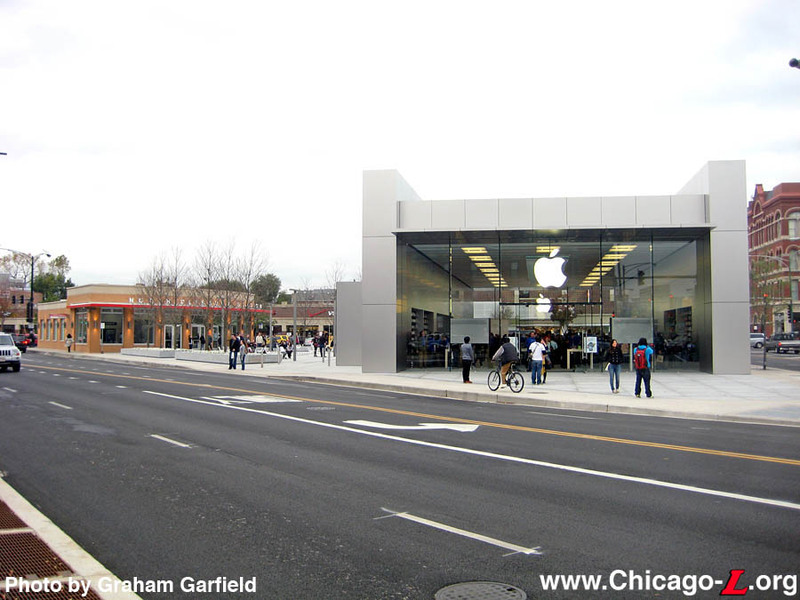 CTA's agreement with Apple, which built a new Apple Store retail outlet on the adjacent property to the east, provides $3.9 million to undertake the improvement work, which includes improvements inside and outside the station. 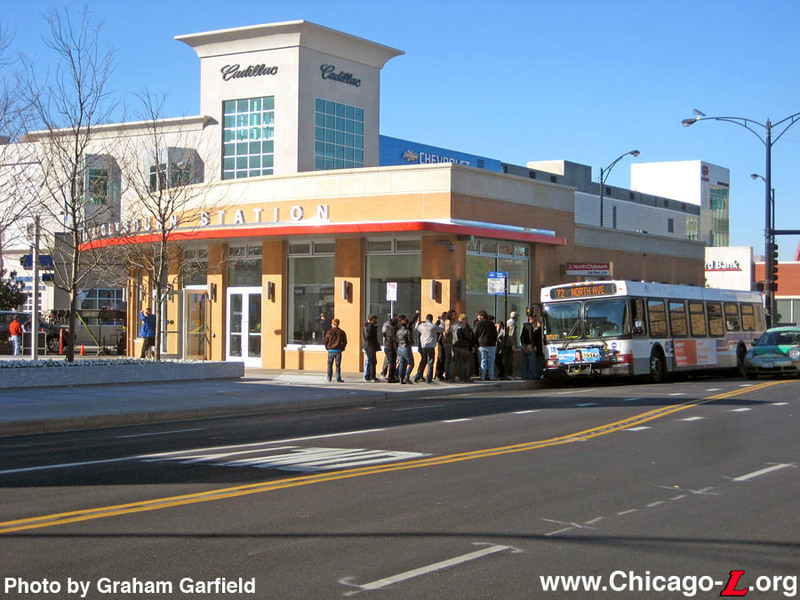 In the agreement, approved by the Chicago Transit Board on August 19, 2009, in exchange for the improvements the CTA leased the bus turnaround that formerly wrapped around the station's east side to Apple at no cost for 10 years, with options on four, five-year extensions. 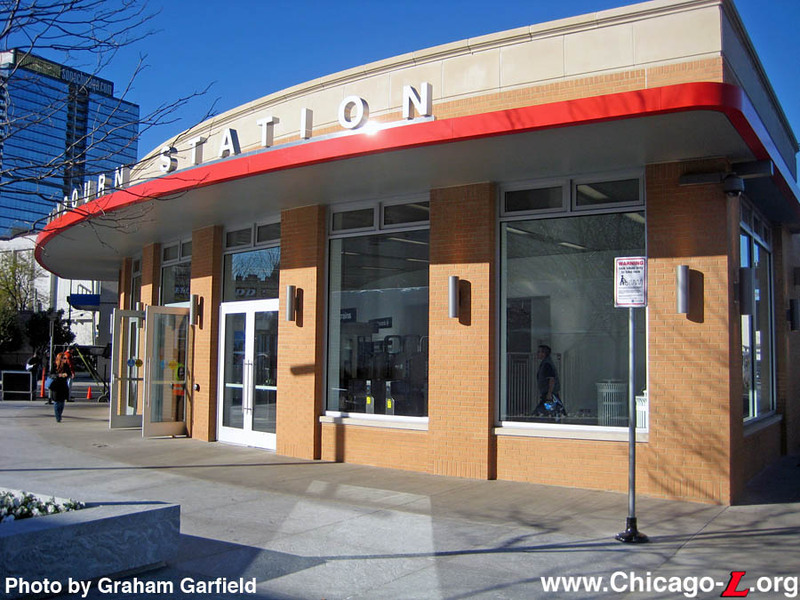 The CTA also gave Apple "first rights of refusal" for placing advertising within the station, as well as first dibs on naming rights to the station, if the CTA later decides to offer those rights to outside bidders. The price for naming rights would be based on the market value as determined by a consultant to be hired by the CTA, the agreement says. According to the ordinance (No. 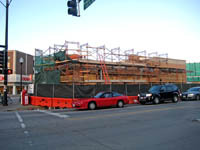 009-92), Apple would pay for construction work on the outside of the building, not to exceed $1,789,000. The company also would pay for the CTA’s design, construction management and actual construction costs, not to exceed $2,108,000. 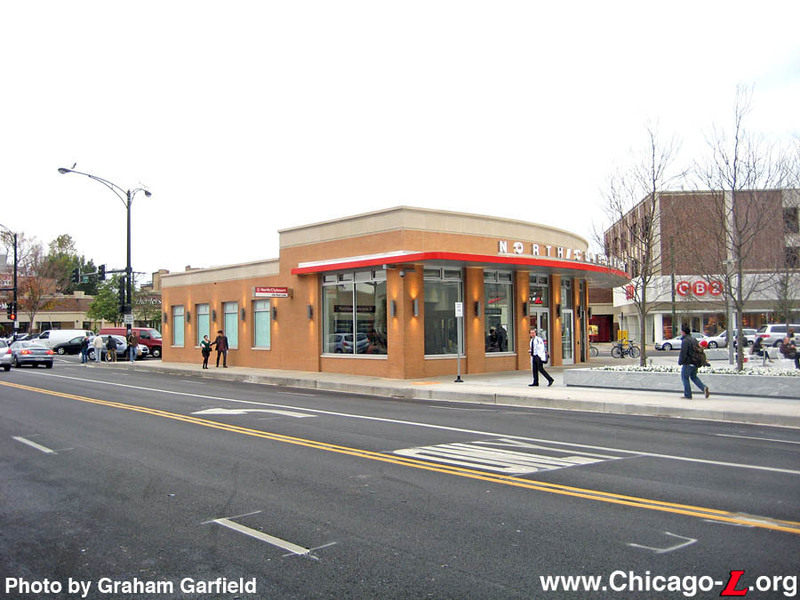 As part of the project, the North/Clybourn station house exterior was renovated with a new buff-colored masonry facade, new lighting, new windows and doors, and new signage and Braille. 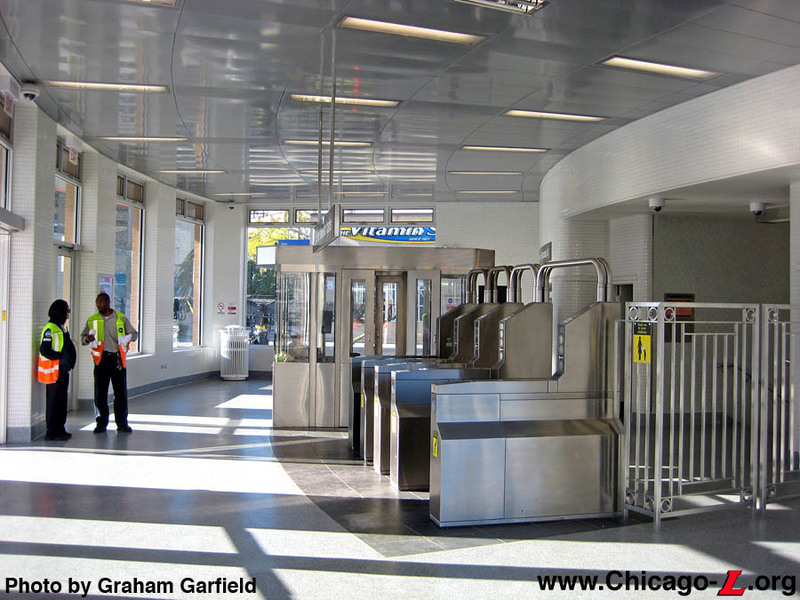 The station house interior was also refurbished, with new gray terrazzo flooring, new white tile walls similar in design to the original tiles from the 1943 opening of the facility, new lighting, additional turnstiles and farecard vending machines, a new stainless steel Customer assistant kiosk of the type used at the new Brown Line stations, new signage and Braille, and improved customer flow in and out of the station. In a clever reuse of features in the station house, the farecard vending machines were placed in the alcove that formerly, original housed the "sound-proof" telephone booths, one of the Initial System of Subways' "five-star features". 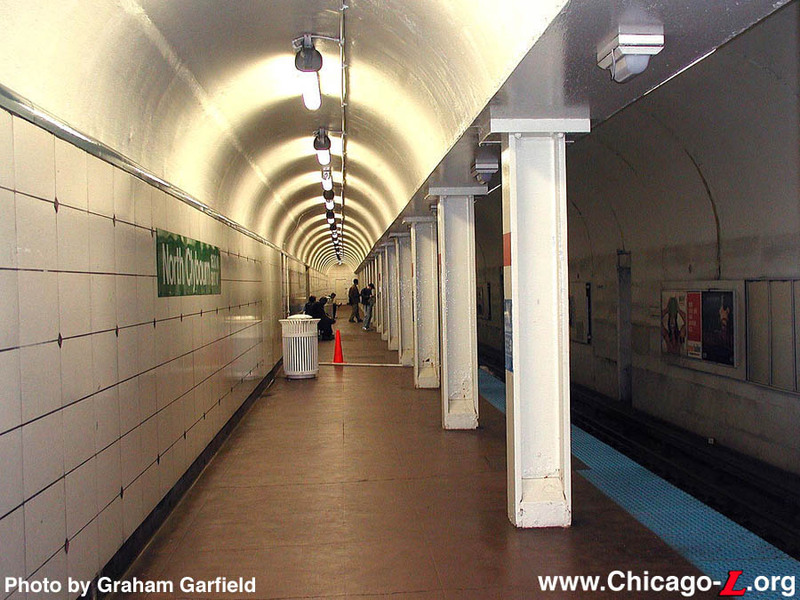 Some limited improvements were made at platform level, including improved lighting and new benches, as well as repainting of platform columns and ceilings and backlit advertising panels on the tunnel wall. New security cameras were added throughout the station. 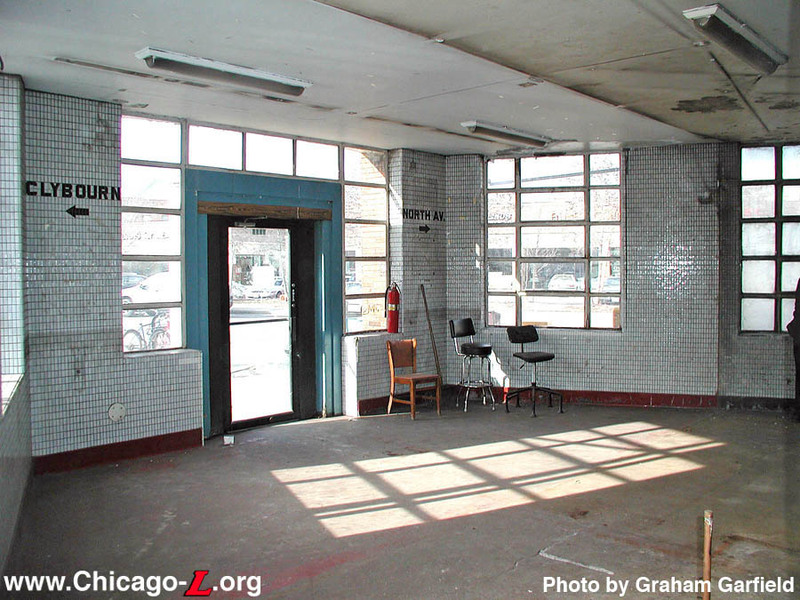 Historic preservationists, led by the advocacy group Landmarks Illinois, fought to convince the CTA to preserve some of these historic elements in the station renovation, but an agreement could not be reached before the CTA, Apple, and its contractors had begun demolition work on the building. In addition, because the project was funded with private funds rather than government grants, it was not subject to the federal Section 106 review process for historic properties mandated by the National Historic Preservation Act of 1966. 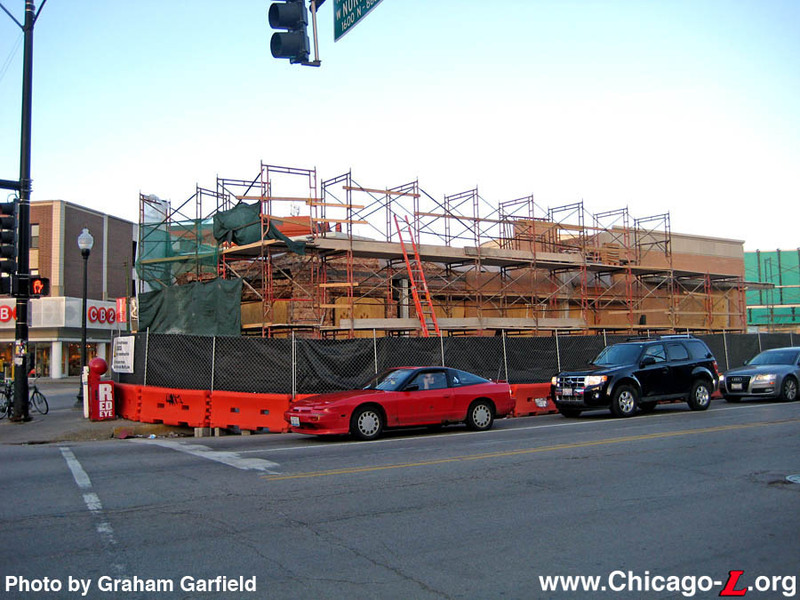 Work on the station started in Spring 2010, beginning with the exterior facade work. The original brown face brick, cut stone cornices, and red polished granite base were removed from the exterior of the Art Moderne-style building. Also removed were the last remaining original 3-by-5 multi-pane windows with metal sashes and the one remaining original revolving door at the Clybourn Avenue doorway. Removal of the exterior face brick revealed some deterioration in the structural steel members of the building structure, which were repaired before installation of the new facade. By mid-Summer, the new exterior was largely complete. Replacing the original materials were buff-colored bricks, large plate-glass windows, and modern light fixtures. The canopy over the former bus turnaround -- vacated and removed, replaced with a plaza between the station and the new Apple Store as part of the project -- was refurbished, and projecting backlit station entrance signs were added to the North Avenue and Clybourn Avenue elevations. The doors on those sides were also removed due to new doors having to swing outward per fire code, which would not have worked well due to the relatively narrow sidewalks on those sides. 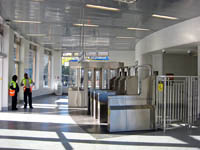 The doors were relocated to the former bus turnaround side, creating a larger bank of doors to accommodate the station's passenger circulation. 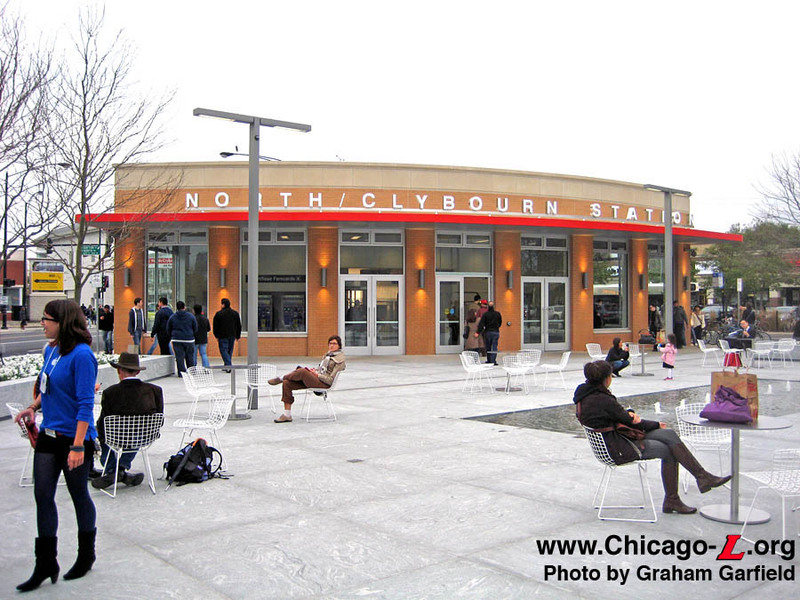 Large, lit stainless steel letters spelling out "NORTH / CLYBOURN STATION" were installed atop the curved canopy facing the plaza in late July. 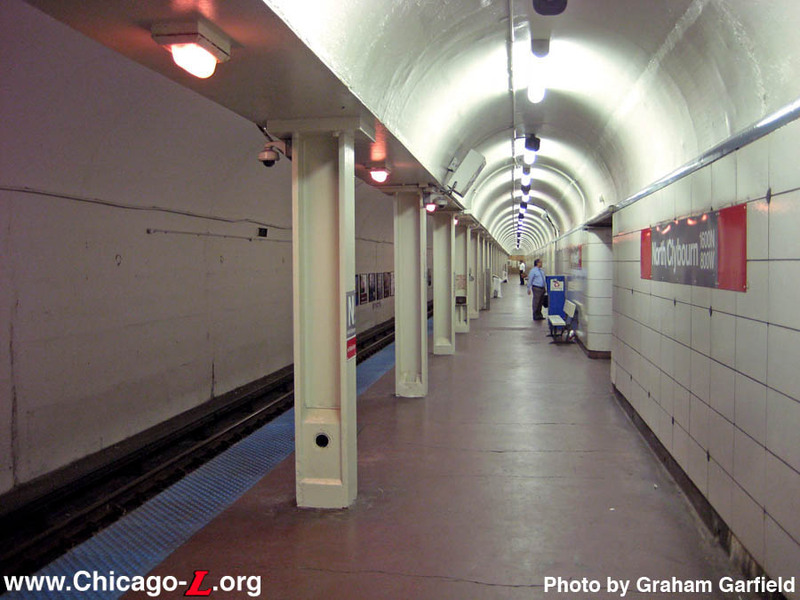 In June, work began on the interior, with staging proving a challenge due to the limited space inside and the CTA's desire to keep the station open during construction. 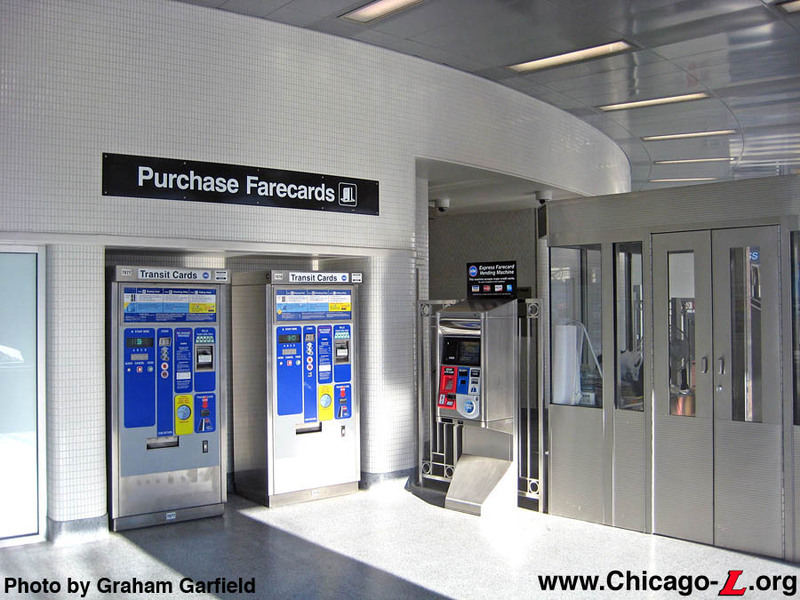 The original ticket agent's booth was removed, and the turnstiles relocated to the north half of the interior, along with the farecard vending machines and a temporary Customer Assistant booth, to allow work on the south half to proceed. By August, the new metal paneled ceiling and lighting had been installed, and the new terrazzo floor poured in the south half of the interior. 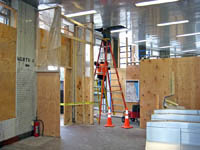 In late August, renovation of the south half of the interior of the station house was largely complete, and staging changed to open this half to customers and closing the north half for renovation. The new flooring and wall tiling was completed in the north half of the station house in early October 2010, allowing the full interior to be reopened for passengers. In mid- and late October 2010, crews worked to install one of the final fixtures of the renovation project -- large backlit advertising panels on the tunnel walls opposite the platforms, which exclusively feature Apple advertising. 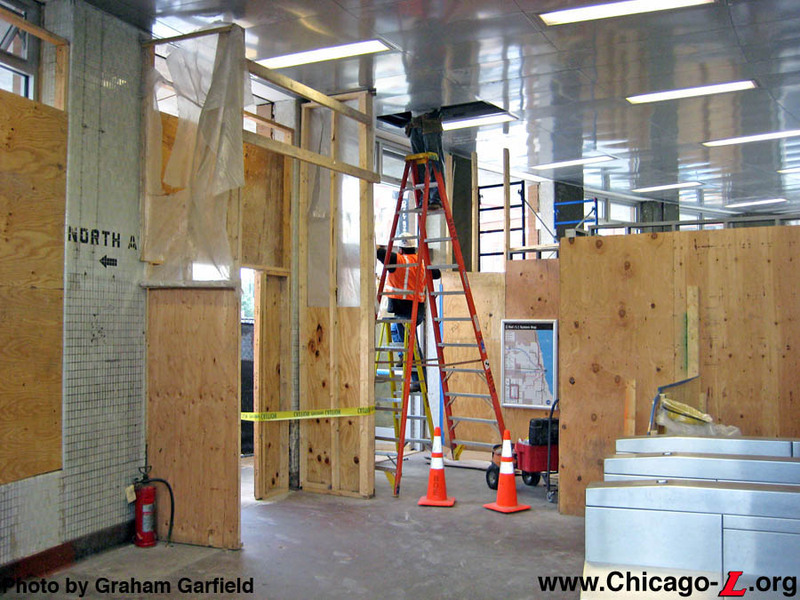 Contractors and CTA personnel spent the remainder of October completing finishing touches on the station house exterior and interior in anticipation of the opening of the new Apple Store next door on Saturday, October 23, 2010. Punchlist work, such as the installed of bike racks outside the station, was completed during the late week of October and the weeks that followed.